(See Cox and Oakes 1984, Ch. 3.) In these expressions is the set of uncensored observations, is the set of censored observations, and n denotes the total sample size. The proportional hazards specification expresses the hazard in terms of a baseline hazard, multiplied by a constant. In this example the hazard is that of a Weibull model and is parameterized as and . The linear predictor is set equal to the intercept in the reference group (group = 2); this defines the baseline hazard. The corresponding distribution of survival past time t is . See Cox and Oakes (1984, Table 2.1) and the section “Supported Distributions” in Chapter 55: The LIFEREG Procedure, for this and other survival distribution models and various parameterizations. The “Specifications” table shows that no integration is required, since the model does not contain random effects (Output 68.5.1). No starting values were given for the three parameters. The NLMIXED procedure assigns the default value of 1.0 in this case. The negative log likelihood based on these starting values is shown in Output 68.5.2. NOTE: GCONV convergence criterion satisfied. The “Iteration History” table shows that the procedure converges after 17 iterations and 34 evaluations of the objective function (Output 68.5.3). The t statistic and confidence limits are based on 38 degrees of freedom. The LIFEREG procedure computes z intervals for the parameter estimates. Since the slope estimate is negative with p-value of 0.0185, you can infer that pain reliever 1 leads to overall significantly faster relief, but the estimated probabilities give no information about patient-to-patient variation within and between groups. For example, while pain reliever 1 provides faster relief overall, some patients in group 2 might respond more quickly than some patients in group 1. A frailty model enables you to accommodate and estimate patient-to-patient variation in health status by introducing random effects into a subject’s hazard function. The following statements model the hazard for patient i in terms of , where is a (normal) random patient effect. Notice that the only difference from the previous NLMIXED statements are the RANDOM statement and the addition of z in the linear predictor. The empirical Bayes estimates of the random effect (RANDOM statement), the parameter estimates (ODS OUTPUT statement), and the estimated cumulative distribution function (PREDICT statement) are saved to subsequently graph the patient-specific distribution functions. The “Specifications” table shows that the objective function is computed by adaptive Gaussian quadrature because of the presence of random effects (compare Output 68.5.6 and Output 68.5.1). The “Dimensions” table reports that nine quadrature points are being used to integrate over the random effects (Output 68.5.7). The procedure converges after 15 iterations (Output 68.5.8). The achieved –2 log likelihood is only 1.2 less than that in the model without random effects (compare Output 68.5.9 and Output 68.5.4). Compared to a chi-square distribution with one degree of freedom, the addition of the random effect appears not to improve the model significantly. You must exercise care, however, in interpreting likelihood ratio tests when the value under the null hypothesis falls on the boundary of the parameter space (see, for example, Self and Liang 1987). The separation of the distribution functions by groups is evident in Output 68.5.12. Most of the distributions of patients in the first group are to the left of the distributions in the second group. The separation is not complete, however. 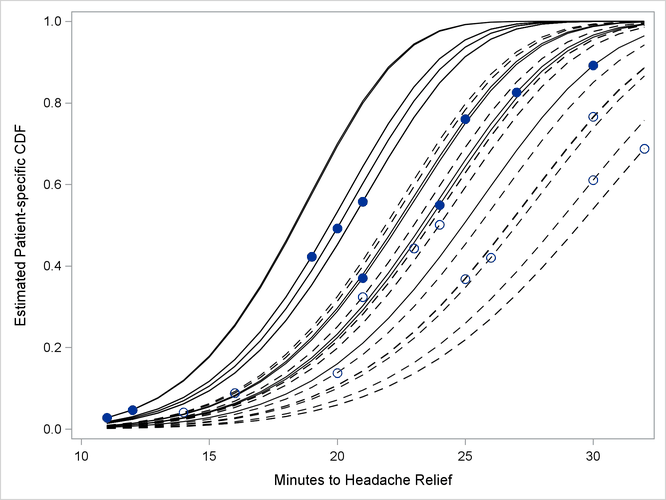 Several patients who are assigned the second pain reliever experience headache relief more quickly than patients assigned to the first group. Output 68.5.12: Patient-Specific CDFs and Predicted Values. Pain Reliever 1: Solid Lines, Closed Circles; Pain Reliever 2: Dashed Lines, Open Circles.